Doug is surprised to see Adam get up so late, and tells him the day started hours ago. but Adam isn't impressed at being a labourers assistant, and complains about the blisters he got last week, that still haven't healed. Pam reckons he takes after her more than Doug; soft and sensitive. Doug points out he needs a hard worker for the job, so Adam suggests he takes Cody. Pam picks up an orange to find Adam has stitched it up, he explains that he was practicing; as orange skin and human skin are quite alike, apparently. Pam is pleased to hear that he wants to specialise and become a surgeon, but Doug would rather he hurried up and had breakfast so they could get to work. Jim is on the phone to Nancy, who was going to invite him to dinner with Bev, but didn't hear about the split, so backed out. Jim is disappointed at the number of friends he's lost out on since the divorce; all the times they met as couples. Helen reminds him that there are other options, and that he'll never make friends moping around the house. 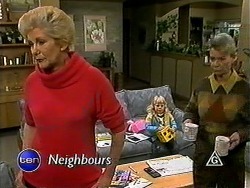 Pam arrives in the hope of finding Cody, but Helen hasn't seen her or Todd since the morning. Bev points out that after her brother had a divorce, he too moped around the house all the time and ended up falling in love with the lady who started delivering all his food. Pam invites them to dinner that evening. Helen can't, but persuades Jim to go anyway. Madge arrives to see Harold; she's brought Joe's post with her too, in case there's a letter from Eric about Sky. 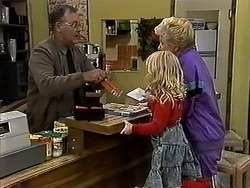 Harold isn't so sure they should be snooping through his post, but Madge opens it anyway. 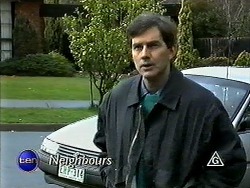 It's a letter from Eric's solicitor informing them of the situation. Meanwhile, Harold has opened a letter from the family court, issuing them a day for a hearing. Madge realises that Joe won't be back in time, she worries that they might not be able to find him. As Doug and Adam load stuff onto the back of the ute, Caroline pops down to see Adam; they joke about their number of failed dates recently, so he offers to take her out to dinner with his well earned cash that evening. She has a better offer; dinner at her place and a video; they'd have the place to themselves. They agree to meet later, and she heads off. Jim tries to call an old friend, but she only remembers who he is when he mentions Bev. It seems their friends have since got back together as a couple and are no longer separated. 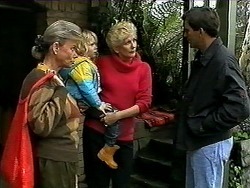 Jim offers to meet up with them, but it seems they would rather meet Bev. He hangs up. Returning to Helen in the kitchen, Jim isn't convinced he's going to be able to find anyone to take with him to dinner at the Willis'. Helen reminds him that he doesn't have to take a date, and should go anyway. Jim reluctantly agrees. Doug can't understand why Pam has invited Jim to dinner; last time he came he tried to punch the lights out of him. Pam tells him to stop whining and stir the pot. Caroline arrives wondering where Adam has got to, it seems he had a hard day of labouring and fell asleep. Pam offers for her to stay and have a drink while he gets ready. Jim arrives, so Doug offers their guests a drink. Jim admits to Pam that he didn't bring anyone with him, but Pam tells him not to worry. 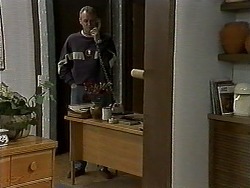 Harold is on the phone trying to get hold of Joe. It seems that he and Toby left the hotel a few weeks back. Madge wonders about ringing all the caravan parks up the East Coast to try and find them, but Harold points out it'll be like finding a needle in a haystack. He wonders about talking to the solicitor and seeing if they can postpone the hearing. Madge wishes that Joe would make the effort to contact them himself. Caroline asks if Adam is ready for the next meal, and gets up to prepare it - Cajun Chicken. She wonders how hard Doug is working him at the builder's yard, and although Adam says not much, it seems the two men may be trying to outwork each other. As Caroline heads to the kitchen to start cooking, Adam doses off to sleep. Doug, Pam and Jim are talking about sports, Pam mentions they should have a tennis match, but quickly realises that doubles wouldn't work. Jim points out he's quickly learning how the world revolves around couples so much. Adam and Caroline arrive back. Caroline tells the others that Adam fell asleep over dinner, and sends him off to bed. Once Adam has gone, Caroline asks Doug not to work him too hard the following day as she intends on taking him out for a proper date. Madge is busy looking through some bags of old clothes when Eric arrives. He asks if he can have Sky for the day, but Madge tells him that he's got no chance and heads back inside with Sky. Helen advises Eric not to argue with Madge. Back inside, Madge watches Eric out the window. Eventually he leaves. She worries that he might not have gone very far and be back to steal Sky soon. She's worried that they don't know what kind of person he is, and until he has legal custody, he'll never see her. She admits that she's scared for Harold; she's not sure how he'd cope if they lost Sky. 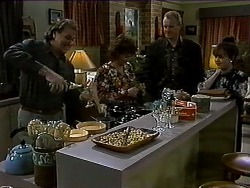 Doug arrives home to find Pam and Adam working at the table. 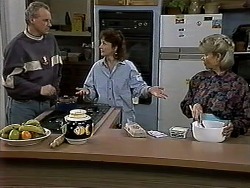 Doug however is keen for someone to make him lunch, but Pam tells him to get it himself. 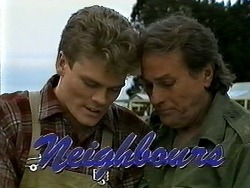 He asks Adam if he'd like to come and help him on the building site that afternoon, but Adam admits he's got work. Doug guilt trips him into helping. While Adam goes to get ready, Pam asks Doug not to work Adam so hard as he's got a lot of study. 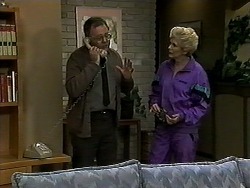 Madge turns up with Sky and informs Harold of Eric's appearance. They agree to not let Sky out of their sight and to keep and eye out for Eric at all times. They hope that Joe will get in contact with both of them soon. Doug asks Adam to make some cement for him, but Adam points out he knows how to do it. Leaving him to it Adam starts to put sand into the cement mixer; however the machine jams and Adam gets his thumb caught trying to fix it. 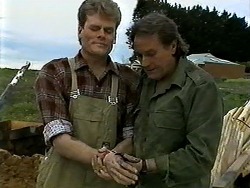 Doug rushes over to help him get his hand out, but his thumb is badly injured.